Will there be a United Ireland soon? Firstly to talk about a united Ireland, we must talk about why Ireland is divided, why in the 21st Century, when it is universally accepted that colonialism and imperialism is wrong, there is a part of Ireland that is partitioned from the rest and under foreign occupation. The Partition of Ireland is a relatively new reality, there are people alive today in Ireland that are older than partition, that did indeed live under a united Ireland - an Ireland united however under British rule. The history of Ireland stretches back more than fifteen hundred years. Throughout its turbulent history it has seen forms of independence, and worse still long periods of foreign occupation, even up to the present day. The British have had a foothold in Ireland since the 12th century and with Occupation came all the usual components consisting of military brute force to suppress the people; plantations of people to reinforce its domestic rule, all the while suppressing the native culture, language and traditions. Throughout all this there has always been a respectable minority, and at times majority, of resistance from the Irish people. The partition of Ireland resulted from the British government’s refusal to implement the democratic will of the people of Ireland. As students with an interest in Irish history I will not bore you with a detailed account of the history of Ireland up until the point of partition, but what I hope to do is explain and reinforce why an Irish Republic is inevitable and that the continued partition and occupation of Ireland is an infringement on the rights of the Irish people, and when I say Irish people I mean ALL, all religions, classes and creeds. The partition of Ireland and the creation of two states in one country is in direct contrast to the will of the people of Ireland. The last all-Ireland election in 1918 overwhelmingly supported the creation of a 32-County Republic, based on the principles of equality and inclusivity for the whole people of Ireland when Sinn Fein took 49.6% of the vote - 73 seats out of 105. Since then there has been no 32-County vote so the will of a minority in the north-east of the country supersedes that of the majority. (We have had two separate referenda, on a partitionist basis, one in the Occupied Six Counties and the other in the 26, but never a 32 County one). This illustrates how undemocratic British occupation has been in Ireland, and how it can never work. When the 1918 election returned results that the British Government did not approve of, instead of allowing the people to implement the democratic decision, they refused to acknowledge it. 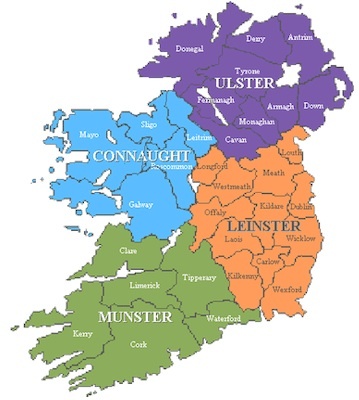 In 1921 the creation of the Six County-State was “a Protestant Parliament for a Protestant people”, created arbitrarily based on a sectarian headcount, creating an artificial country against the wishes of the Irish People. As a result of the wishes of the Irish electorate not being met, we now live in a divided country. Divided on sectarian lines through this artificial manifestation of the British empire; the British empire which is world renowned for its brutality and disregard for the international community, who have carried out atrocities in not only Ireland but all over the world and still believe themselves to be the peacekeepers. They are agitators who have turned communities into rivals and used native collaborators to rule with an iron fist on their behalf. Throughout their history in Ireland they have been responsible for some of the most heinous war crimes against the civilian Irish people and also those who would defy their barbaric regime. Political prisoners have been denied basic human rights, using them as tools to break the wider struggle, they have taken Irish men and women and locked them up, some for years at a time without charge or trial, they have murdered unarmed civilians and what is more sinister, they have armed and actively assisted loyalist death squads whose sole purpose was to murder innocent people based on their religion at the behest of their British paymasters. Bloody Sunday, Derry 1972 is just one of the atrocities that you may have heard of. A few months earlier members of that same Parachute regiment of the British army killed eleven people in Ballymurphy, Belfast, including a Catholic priest. Republicans have never engaged in a sectarian war. Republicanism is about the ending of British occupation, it is about the independence and self-governance of the Irish people, be they Catholic, Protestant or Dissenter, based on the principles of equality and inclusivity of all sections of the Irish people. Citizens are not free to express or hold political opinions contrary to that of the state; even the judiciary is tied to the decisions of one person, ie the British secretary of state who can countermand the decision of the court if it does not suit the British political agenda. One such case is that of Political Internee Martin Corey who has now been in Maghaberry Jail for more than three years without charge or trial. The most senior human rights judge in the Occupied Six Counties ruled that his incarceration was a breach of Martin Corey’s human rights and ordered his unconditional release on bail. That same day the British Secretary of State to Ireland, in an abuse of his power as is so often the case with British ministers, ignored the decision of the court and personally ordered that Martin Corey was to remain incarcerated. And so I will move on to why an Independent Ireland is the only way forward for the Irish Nation, why only independence can bring about a true, just and lasting peace for all the Irish people not to mention prosperity and equality. The current policy, based on the Belfast Agreement signed in 1998, seeks to make the artificial Six-County State work within the ‘UK’ by an elaborate system that has been labelled “power-sharing”. Since this agreement did not address the basic problem of British rule in Ireland it was flawed from the start and deceitful. It promised to strengthen the union for the unionists and weaken the union for the nationalists, a laughable proposal which of course cannot work. This whole concept breeds sectarianism and therefore a lasting peace in this country cannot be achieved through this strategy. Republicans advocate a Federal Ireland, as many Americans know democracy is a sacred thing, freedom is a sacred thing, indeed America, the biggest super power at present, had humble beginnings at one time also, being just another country occupied by the British Empire. Could America have risen to such prominence while under the yoke of imperialism? I think not and Ireland cannot prosper under occupation either. There are common misconceptions about Republicans and Republicanism, one of which is that we advocate joining the 26 Counties. This could not be further from the truth. One of the biggest objections to an all-Ireland Republic is that the “South” cannot afford us and why would we want to unite with them when they are going through economic turbulence. This is a good point, why would we want to join with them? They have suffered from partition as much as the Six Counties has. What we advocate and what we must do is create a New Ireland, a new government, a new economy. The Six-County state does not work, it is reliant on the British Government to secure it own survival, An Irish Republic would secure a new economy and a new future. The historic province of Ulster has not done well from British Occupation, once one of the most prosperous and economically viable areas of Ireland it has now been reduced to a bit part in another mans’ economy, relying on handouts. A situation that is unsustainable. The objective of Sinn Fein Poblachtach is to establish a new society in Ireland. To achieve that, the structures of undemocratic partition rule must be abolished; they must be replaced with entirely new structures based on the unity of the Irish people as a whole, with a new Federal Government the people would have real power. Each Province would have its own assembly to ensure responsible representation. The Eire Nua programme provides for a strong provincial and local government, designed to ensure that every citizen can participate in genuinely democratic self-government, and to guarantee that no group can dominate or exploit another. Under this programme all traditions in Ireland can make a valuable contribution to the nation. Eire Nua will provide the basis for implementing progressive social, economic and cultural policies. The people who are currently described as Unionist are a part of the Irish nation. Under Eire Nua their views, traditions and beliefs would be enshrined and protected, indeed as Ulster may be majority Protestant then the Federal Parliament of Ulster would be majority Protestant. It is not enough to just remove occupation from Ireland, we must remove the vestiges of occupation; from its economic failures to its oppression of minorities. By removing the British-imposed capitalist system we will create the room in which Ireland can re-establish itself economically from the wealth of the nation and its natural resources, in order to fund and sustain the services of which a new all Ireland federal government would provide for the people. This is a vital and integral part of what a New Ireland would be, a Government of the people, by the people and for the people in direct opposition to what the current status quo is, where an occupational government exploits for itself to the detriment of the people, taking from the most vulnerable in society. Being a government of poor moral practices they take from the poor and give tax breaks to the rich in a reverse role of their own legendary Robin Hood. How anyone can support a union with a system so corrupt and so against the ordinary working-class people, be they Catholic, Protestant or Dissenter, beggars belief when a new reality could be composed within the creation of a new Ireland. The impact of Partition on areas of Ireland along the British-imposed Border has been particularly injurious. The natural resources of Ireland are being removed and sold to the highest bidder. The wealth of Ireland does not go to the people of Ireland, this is something that would be addressed and rectified in the context of a New Ireland. English rule in Ireland is an injustice, an infringement of Irish national sovereignty, anything less than British disengagement will only prolong the political instability and lead inevitably to further armed resistance. Every occupied country in the world has the inherent right to defend itself from foreign aggression. Many countries have asserted that right, Ireland is no different from countries such as India or indeed America. When America was occupied, the Americans formed an independence movement and expelled the British empire. British propaganda throughout the world portrays ‘the occupied’ in Ireland as standing in the way of peace, surely logic would submit that it is the occupiers who stand in the way of true peace. It is the occupiers who breed resistance among the people - resistance to the failed, deceitful and gerrymandered political system, to the practice of censorship and punishment for peaceful protest. Like many other occupied countries throughout the world, the Irish too have organised a resistance movement, both politically and militarily. This is not done for selfish gain but for the benefit and rights of all the people of Ireland regardless of tradition, religion or background. They have tried it all - oppression, coercion, murder, starvation, intimidation, treaties, partition and power-sharing - none have worked, none have pacified the people of Ireland to be content with British rule, what we haven’t tried is the one thing that has a real chance of working, Irish independence. Should the British withdraw and leave the Irish people to their own devices, the Irish people in the common name of Irishman, would work together as a single unit, without outside interference and free from the clutches of imperialists who serve only to exploit those who would allow them, for a free, independent united country. This is as relevant today as it was in his time, and this is still the primary objective of Republicanism, and it is only through the unification and independence of Ireland can the Irish people know true peace and achieve their own potential. So will there be a united Ireland soon? The vision is clear, the strategy is laid out, the people are ready, they just need the confidence to assert ownership to what is theirs to begin with.